Not sure which mythical new iPhone is right for you? If you are a self-respecting iPhone user, you will print out mockups, cut them out, tape them to cardboard, and carry them around to help see which model you prefer. 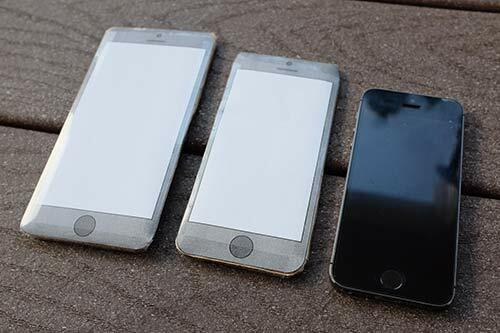 Download my mockups which show the expected 4.7 and 5.5 inch models next to the existing 4 inch iPhone 5/5s. When you print, be sure to not scale the document. Or manually enter scaling of 100%. After cutting out mockups, tape as much cardboard as you need to reach your assumed phone thickness. Are your hands big enough to reach the top left of the screen one-handed? If you are Shaquille O’Neal, you won’t have a problem with the 5.5 inch model. Otherwise, are you okay crimping your hand in a weird grip for one-handed operation? I can barely do this for the 4.7 inch, so the 5.5 inch would be a two handed operation for most of my use. This means I would type on the 5.5 inch iPhone like an iPad, two thumb style. The 5.5 inch iPhone would be more difficult to use while crammed on the metro. Scrolling through an article would work, but navigating around the phone could mean a hazardous lapse of holding onto the safety bar. And no one wants to be knocked over by someone carrying a giant phone. Does the phone fit in your pants and jacket pockets? Do you feel like an idiot holding a large rectangle up to your head? There isn’t much time left to decide before the September or perhaps October announcement. Tip: don’t let people at work see you using a pretend iPhone. Not everyone understands the importance of this decision.